In 1976, Carolina Circle Mall opened in the northeast corner of Greensboro, North Carolina. At over 750,000 square feet, it qualified as a regional mall, with three major anchors — Belk, Montgomery Ward, and Ivey’s (now Dillard’s) — as well as theaters and an ice skating rink. It was designed to create a real estate boom in the northeast corner of the city. Twenty-three years later, Belk is gone. Dillard’s is gone. The theaters are closed. Montgomery Ward has the same lime green and burnt orange carpet it had in 1976, which seem to give it a remarkable staying power. Most stores are vacant; many of them were never occupied at any time in the past two decades. The county is seriously considering converting the mall into offices and a community college campus. This is the definition of a ghost mall. Maybe this is why I’m so fascinated with ghost malls. I grew up going to Carolina Circle Mall pretty regularly. And during my early 20’s, I spent a year working in this mall. Some would say Carolina Circle was doomed from the start. Its design was so outlandishly “70s modern” that the whole place looked out of date within two years of its construction. The neighborhood was not great and got worse over time; Greensboro’s wealth and population have always clustered to the west. 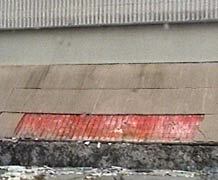 On top of that, the site was plagued by an intense stench for its first few years due to a nearby waste treatment plant. 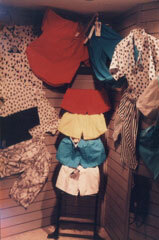 When I worked in the mall in 1985, rumors of its demise were already at hand. 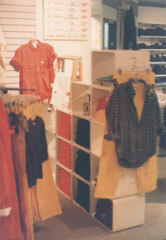 Over a third of the space was vacant even then and the remaining stores were vacating at an alarming pace. No one was updating; most chain stores were museum pieces already. The store I managed made its retreat shortly after I left in early 1986. It was already very troubled. The few customers who braved the mall were redneck mall rats who came mainly to play pinball and buy drugs, and project kids who hung out by the skating rink. Unlike the malls of today which are designed to discourage teenagers, Carolina Circle was designed to attract them. Maybe this was one of the biggest mistakes its developers made. A complete internal renovation late in the 1980s slowed the pace, and some chain stores actually came back…briefly. Ward’s attempted to mask their screaming orange exterior tiles, but didn’t bother to replace some of the original 1970s lime green shag carpet inside. In keeping with the fashion of the time, the interior of the mall was very blue, and (once again) looked rather dated only a year or two later. 1958: Developer Joe Koury starts talking about building a shopping center in southwest Greensboro. He expands his plans several times during the 1960s but doesn’t start the project. While he waits, other developers make plans of their own. 1972: Alpert Investment Corp. of Atlanta proposes building a mall off U.S. 29 in northeast Greensboro. Then, in October, Koury’s Imperial Corp. breaks ground on Four Seasons Mall. April 1974: Alpert breaks ground on the Carolina Circle Mall in the city’s northeastern outskirts. The owners figure the location will attract shoppers from Reidsville,Eden, Burlington and even southern Virginia. The site is difficult to reach by car, but Mayor Jim Melvin and other city leaders push successfully for public money for street improvements. February 1975: Koury’s Four Seasons Mall opens off High Point Road. The two-level mall features about 95 stores and 900,000 square feet of retail space. It’s the city’s first enclosed mall. 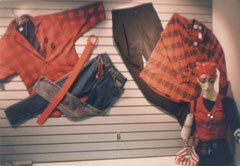 February 5, 1976: Belk opens at Carolina Circle. It’s the mall’s first store. June 1976: The mall’s ice skating ring opens. July 30, 1976: The mall sponsors a gala ball benefiting the Carolina Theatre. More than 1,200 people dance to Glenn Miller and other Big Band music. There’s talk of making the ball an annual event. Aug. 4, 1976: The mall holds its grand opening. Mall manager Ray Brantley says the special features like the ice rink will appeal to children much as Ronald McDonald and McDonald’s playgrounds help sell hamburgers. “The housewife spends most of the disposable income in the family,” he says. “And who controls the housewife? The kids. It’s true. We want this to be a pleasant place for kids to be.” Twenty-two stores opened, with another 50 to follow within a few months. Visitors also notice the smell of the city’s nearby sewage treatment plant. Equipment is later added to the plant to reduce the smell. November 1976: Piccadilly’s cafeteria and the mall’s six-screen cinema open. December 4, 1977: At 10:30 on a Sunday morning, three deer,apparently startled by cleaning equipment churning through the mall parking lot, panic and run through two plate glass windows. The deer then fall 18 feet to the mall floor, near the ice rink. One doe breaks its neck and dies. The other two are captured and released. Deer are a common site near the mall, which is still on the outskirts of town at this time. August 1986: An Australian firm buys Carolina Circle through its U.S. subsidiary, Sunshine Properties Inc. of Dallas. The new owner promises to renovate the mall to keep up with Four Seasons. At the time, Carolina Circle’s vacancy rate is 10 percent, compared to 1 percent at Four Seasons. Shopper traffic is sagging. April 9, 1987: Four Seasons opens its new third floor after 18 months of construction. That brings the mall’s repertoire to 200 stores. June 1988: A $6 million renovation project is completed and Strouse Greenberg unveils the new Carolina Circle Mall.Changes include a new logo, brighter lighting, and a $250,000 custom-built carousel. The owners eliminate the mall’s most distinctive feature: the ice rink. Merchants and skaters are incensed. It was the only ice rink in Greensboro. 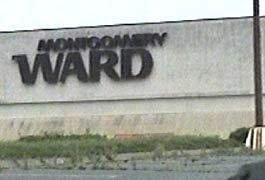 Jan. 15, 1991: Robbers shoot and wound a 54-year-old man while he walks out of the mall’s Montgomery Ward store with his two daughters. The incident fuels a perception that the mall is dangerous. Sept. 11, 1992: Greensboro police open a satellite station at the mall. The city pays $1 a year for the space. City leaders say they hope the station will make shoppers feel more secure. Some Carolina Circle merchants complain that having a police station is a bad thing because it gives visitors the impression that the mall needs a police station. Sept. 30, 1993: George D. Zamias Developer, buys the mall for $16 million in cash and agrees to take over the $21.17 million mortgage. Company president George D. Zamias promises to market the mall aggressively. February 1994: The U.S. Postal Service signs a 10-year lease to put a mail facility in the first floor of the Carolina Circle Belk’s department store. Belk keeps the top floor open as a store. July 1996: Some of the mall’s bread-and-butter stores -Camelot records and Waldenbooks, for instance – already are gone as Piccadilly Cafeteria says it will close its doors at the end of the month. A few days later Radio Shack says it, too, will move soon. Remaining merchants worry about how they’ll survive. 1998: Belk and Dillard’s finally close their stores, leaving Montgomery Ward as the sole anchor. Fall 1999: Guilford County has tentative plans to purchase the mall and convert in to offices and a community college campus. July 2003: There is a sports center, of sorts. Several parking lots are now tennis courts and soccer field. Many of the surrouding banks and other buildings have been converted to storefront churches. The mall building is in a rather sad state of decay. July 2004: Carolina Circle Mall is to be demolished and replaced with an entirely new retail development anchored by a Wal-Mart Supercenter. Fall 2006: All traces of the mall, except for one or two outbuildings, are gone. A new Wal-Mart Supercenter occupies the space, and other stores are under construction. 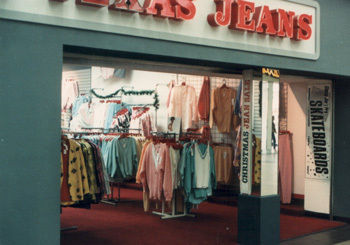 “Texas Jeans” was the name given to mall locations of the “Cheap Joe’s Jean and T-shirt Stores” chain. Malls preferred not have stores with “cheap” in their names at this time. I think there were a total of five Texas Jeans stores (Greensboro, High Point, Columbia SC, and two others) among the fifty or so Cheap Joe’s units. Cheap Joes was a fairly well-known NC chain, selling cheap “youth” clothing, knock-off T-shirts, and its own brand of jeans (Texas Jeans) modelled after Levi’s. 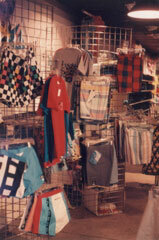 In 1986, the Texas Jeans stores were remodeled and rebranded as “The Exchange” to associate them with the “Surfers Exchange” surf and skate shops the chain had opened in Myrtle Beach and Charlotte. 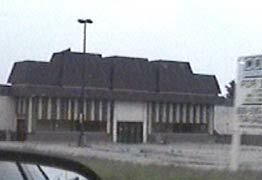 The Carolina Circle branch was on the lower level next to Hardees and across from the food court and skating rink. The space had formerly been a resturant of some sort, and had a really large back room in what had apparently been the former restaurant’s kitchen. This extra space was used as storage for fixtures and other items for the whole chain. I’m not sure when this branch opened. It was probably the early 1980s. It closed about 1987 or 1988. The whole company was gone by 1990. I was assistant manager here in 1985, and managed the store for several months in 1986 before moving to Myrtle Beach and then managing the Charlotte Surfer’s Exchange store from 1986 to 1989. Carolina Circle mall City: A tribute to the late mall. 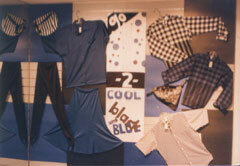 This entry was posted in North Carolina, Reminiscence and Reflection, Travel, Urban and tagged nc1999 by David. Bookmark the permalink. The same can be said for the demise of South Square Mall in Durham. South Square didn’t have a ice rink,but in was unique as being one of the largest shopping centers in Durham,but it was anchored by three department stores(Belk Leggett,JC Penney,and Dillard’s,which was at one time Ivey’s at earlier on was Montgomery Ward). 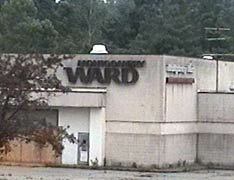 The Wards department store closed in the mid-1980’s and was replaced by Dillard’s,which closed it doors in 2001,which was at the time the only department store standing in 2001 when two of the anchors Belk Leggett and JC Penney moved to the new Streets of Southpoint. South Square also had a movie theatre as well,a four screen cinema located in the lower level of the mall that opened in 1975 and closed its doors in 1992. South Square Mall was demolished in 2002,and it was replaced and renamed as the Shoppes at South Square,and the stores that are there now is a Sam’s Club(on the side where Belk Leggett was),and a SuperTarget(where JC Penney stood). 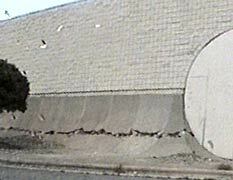 There should be a site as a tribute to South Square Mall too since there is one for Carolina Circle Mall in Greensboro. The malls in my city (St. Louis) pretty much became dead/ghost malls when the Mills Mall (which was bigger, better and etc) was built. What is making the Mills so successful is that it aims at teens unlike most malls. Teens are the biggest group with the most time on their hands and the want and need to buy buy buy. Many people are up in arms upset over the possibility of some of our malls closing, but the odd thing is, most of these people upset abandoned the mall when the Mills was built and are part of the reason these malls are falling. One person in a different website said one of the problems is that malls are made to look too much alike, and people get bored with that, so it helps do them in. 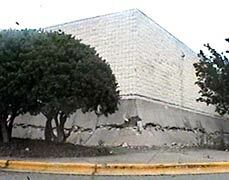 I have so many memories of carolina circle mall . My husband and I went on our first date there to see greese at the movies there and the line went all the way back the the ice rink . We did our honeymoon shopping there and many christmas shopping trips there after and to this day I still walk through that mall in my dreams and we been married 30 years . It was a terrible loss to take it down . I do not shop walmart there I will not to that to my memory . That mall was a happinging place back in the early 80’s. My first job after graduating from Northeast was “Al’s hot dog on a stick”. Yeah pretty corny right? But hey I was making $80.00 bucks a week. I had it made at the time. I was across from the ice rink and eventually ended up dating a figure skater that I am still friends with to this day. There was a time when the Dallas Cowboys Cheerleaders even were there for a photo op. I really think the turning point is when the ice rink was replaced. That was the anchor and the only rink in Greensboro. I eventually worked for Butler Shoe store there and that was an experience too. I remember one time I had a good friend that I will call “Kim” that worked at the pet store next door and I asked her if she had a couple of extra mice that I could get, she ended up giving me a few hampsters. So I went to go see a movis at the Carolina Circle 6 theaters and let the little rodents loose. About 5 minutes I hear this lady scream that she saw a rat!! Yea fun times. All those memories help make a lifetime. It’s hard to believe the Carolina Circle is gone. I was in that area about a year ago and noticed that it’s now a Wal-Mart how sad. I always liked going to CC as a teenager in the late 70’s and early 80’s. Bought my first car stereo there when it had a major electronics store, can’t remember the name. I actually dated a girl while going to college in the area that taught ice skating at the Mall part-time to help pay for her college tuition. I remember the awful stench that came from the sewage treatment plant nearby that sure didn’t help the place. So many memories of CC and Westchester Mall in High Point, it was also a happening place in the late 60’s and early 70’s. Westchester had a Morrison’s Cafeteria, very good food. RIP Carolina Circle Mall. It’s interesting to read people’s fond memories of CC Mall. I moved to Greensboro in 1988, towards to end of CC’s short, sad life, and my impression of the place was pretty negative. In fact, I hated going over to “that side” of town, since it was so dated and decrepit compared to the west side of town. And don’t even mention trying to drive on US 29 through town–not good, unless you’re feeling suicidal. Whoever decided to put a mall in that location did not understand marketing–build it, and they will come! That is–“they’ll come” until the novelty wears off in a couple of months. After that it’s all down hill. So goodbye CCM, you’ll remain in our memories as a shining example of what happens to a bad financial investment in a (more or less) free market. I have many fond memories of Carolina Cirle Mall. Not only was my first real job at the Belk’s there, but I met my first wife while working there. Worked at Belk in the late 70’s and then even worked at Montgomery Ward for a couple of years in the early 80’s. So many great memories. I spent many a night camped out on the sidewalk at CCM because the Belks store sold concert tickets. This was pre-internet days, so about the only way to get tickets was by telephone, box office, or stores like Belks that had a Ticketmaster (or whatever it was) franchise. 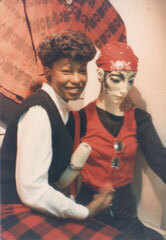 I remember those Belks ladies were sometimes pretty old, but they handled large crowds of ticket buyers with style. Camping out of that sidewalk made one particularly vulnerable to the wafting stench of the nearby treatment facility. My fondest memories of Carolina Circle are going to see the Rocky Horror Picture Show on many a Friday night in the late 80s. By then the mall was pretty desolate, perhaps 50 to 60 percent full. The “Miami Vice” colored makeover was already outdated when it was done. It’s too bad they removed the skating rink. There was a pretty good restaurant called Annabelle’s that overlooked it. One would think that when thease ghost malls are in their die-ing stages the owners would help local people start new businesses by offering reduced rate rentals but it looks like they would rather die amen! I was on the CAROLINA CIRCLE MALL SECURITY staff from August, 1994 until June, 1996 and the Belk Department Store Loss Prevention Manager from June, 1996 until August, 1998. We had to constantly fight THUGS, GANGS, and other bad element. I could not convince the General Managers of the mall and at Belk’s that we needed better equipment and more FULL TIME security and loss prevention personnel to combat the problem. I too worked as a teenager back in 1977 and 1978 at KB Toy’s & Hobbies and Camelot Music. They were super places to work and we had very little crime. The mall security staff at that time were armed officers. I really miss Carolina Circle Mall. 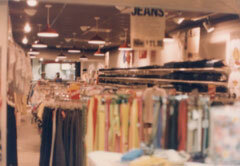 Some of my best memories about Greensboro was shopping at Carolina Circle Mall in the late 1970s and early 1980s. Parking was never a problem for me, unlike Four Seasons Town Centre. Carolina Circle Mall had a charm of its own, and I wanted so much to see the place succeed. It didn’t hurt that I lived within two miles of the mall, which was very appealing to me. The one regret I have is that I never took the time to dine at Piccadilly Cafeteria. Otherwise, I thought I was in retail heaven whenever I visited Carolina Circle Mall. Alas, the city lost a valuable institution when the mall fell on hard times and ultimately folded. But it’s nice to know that I’ll always have the fond memories and treasure them forever. Had my first real date at Annabelle’s in 1986. I was 15, and she was 18 (!). I felt so sophisticated. Camelot Music was the place back in the day. Pet-Go-Round (I think it was). Midnight movies. Hard to believe now but for a little while CCM was the happening spot. In fact I always preferred it to Four Seasons. There was a funkiness to it, and not just the smell. I had no idea it was gone. I would love to have gone in there before they took it down. I miss CCM too, lots of great memories there. But I have an additional story to add to the “ghost mall” effect. My first husband’s uncle was actually killed during the building of CCM. He was one of the construction workers and fell down an elevator shaft into standing water. He did not die immediately, but was hospitzlized for a while before passing. I remember my father taking me to CC in 1990 when I was an incoming freshman college student. It was rather lame, but rather convenient to campus. I distinctly remember commenting on the smell. Eventually if I needed something from a mall quick or wanted to catch a movie close by, I’d go. Otherwise, I’d go to the Four Seasons. My college career timeline mirrored the timeline of the ending days of the place. After over-extending my college career by two years, I ended up working in the post office’s remote encoding center located in the mall. When I graduated in 1996 I left Greensboro. I came back for a college homecoming in 1999, and some guy held a huge homecoming party in the food court. It was actually a great place to have a party. Many of us just stood around and shared our memories of the mall. Now I might go there to buy something from the Wal-Mart if I’m coming to Greensboro to visit and taking 29 as opposed to 95-85. I’ll catch up with you offline, but yeah, the days of the enclosed mall do very much seem numbered.